My name is Kvothe. I have stolen princesses back from sleeping barrow kings. I burned down the town of Trebon. I have spent the night with Felurian and left with both my sanity and my life. I was expelled from the University at a younger age than most people are allowed in. I tread paths by moonlight that others fear to speak of during day. I have talked to Gods, loved women, and written songs that make the minstrels weep. You may have heard of me. So begins the tale of a hero told from his own point of view - a story unequaled in fantasy literature. 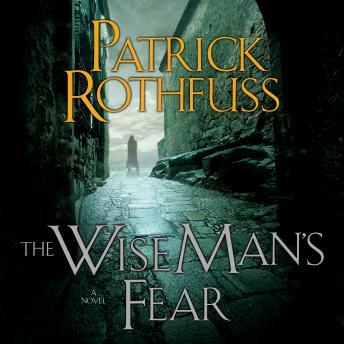 Now in THE WISE MAN'S FEAR, Day Two of The Kingkiller Chronicle, an escalating rivalry with a powerful member of the nobility forces Kvothe to leave the University and seek his fortune abroad. Adrift, penniless, and alone, he travels to Vintas, where he quickly becomes entangled in the politics of courtly society. While attempting to curry favor with a powerful noble, Kvothe uncovers an assassination attempt, comes into conflict with a rival arcanist, and leads a group of mercenaries into the wild, in an attempt to solve the mystery of who (or what) is waylaying travelers on the King's Road. All the while, Kvothe searches for answers, attempting to uncover the truth about the mysterious Amyr, the Chandrian, and the death of his parents. Along the way, Kvothe is put on trial by the legendary Adem mercenaries, is forced to reclaim the honor of the Edema Ruh, and travels into the Fae realm. There he meets Felurian, the faerie woman no man can resist, and who no man has ever survived...until Kvothe. In THE WISE MAN'S FEAR, Kvothe takes his first steps on the path of the hero and learns how difficult life can be when a man becomes a legend in his own time. Yawn. No new concepts, way too much detail not enough story...kept waiting for something to happen, nope. Trying to get my credit back. The book is amazing, but the narrator is not able to give a wide specter of voices and makes the book seem dull. The book and the narrator were both incredibly amazing! If you enjoyed The Name of the Wind, as I did, then most likely, you will enjoy The Wise Man's Fear. I think Rothfuss is a BRILLIANT writer. However, there are some parts that I felt really dragged on and I would get bored, with what I felt, was too much description, details and conversations. I also felt like the story just went off in a completely different direction, that didn't really seem to fit in the story. Especially the part with the Fairy, which again, I felt lasted entirely too long. But, I really enjoyed all the new characters in this book. Sometimes, I would literally burst out laughing, at some of the comments these new characters would make. Tempi and Dedan were my favorite. I was also glad Kvothe got out and about in the real world for a while. It was a nice change from the University and although some of the story felt to drag on, this is an excellent book and well worth reading. It's packed full of everything you want in a fantasy novel. Rothfuss is genuinely, one of a kind. I doubt you will ever read another book that can even compare to his imagination and way of writing. Amazing book, wonderfully narrated! The characters are fantastically rich and the adventures leave you craving more. My only complaint is how long it is taking for the 3rd book to come out. I seldom write reviews but this book was so abysmal that I could only listen to one disc and I rushed to take the other 2 sections off my queue. The author is trying very hard to be Tolkein, or George RR Martin, but all he ends up doing is tossing out fantasy names of monsters and places without giving them any life or depth............... not worth a waste of time. This book definitely is worth a listen. It takes you on a journey that you'll be thinking about long after its over. I’ve never read or list Ned to a better series than the Kink Killer Chronicles! So amazing!!! !